Red Mountain(JM) James Spann, chief meteorologist for Alabama's ABC 33/40 and President of the Coalition of Christian Meteorologists (CCM), announced the launch of a new service to deliver bread and milk to Birmingham residents during periods of actual or threatened severe winter weather. "All too often," observed Spann, "area stores are practically looted of these critical staples at the least hint of possible wintry precipitation. This service will allow families to stay safely indoors near a television while trained volunteers distribute the milk and bread from stocks provided by area merchants." The service is expected to be free of charge, but donations are welcome year-round through the CCM and participating merchants and media outlets. In order to insure that distribution can continue even on the off-chance that a predicted winter storm actually produces hazardous roads, all sixteen 'Severe Weather Response Units' are equipped with all-terrain treads and thermostatically controlled cargo bays. 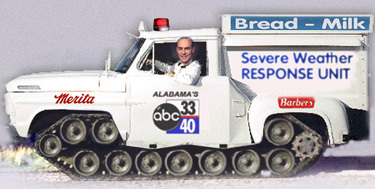 "Had last weeks eight inches of snow actually materialized or inhibited normal traffic," Spann emphasized, "these trucks would have already been on the streets making sure that no family would have to face winter's frozen fury without adequate supplies of Merita brand Old-Fashioned sandwich bread, and Barber's Best fresh dairy milk." While those two companies have pledged money to help fund the service, other brands of milk and bread may be available depending on supply. Mountain Brook() Marty and Elise Mayer are facing the same dilemma that troubles them every year: when to take down the Christmas decorations. And these aren't just any decorations, but the best in the neighborhood. According to 14 year old Samuel Mayer, most of his Christian friends even seem jealous of the Mayer's beautiful decorations. 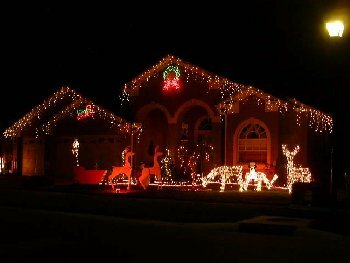 One friend, Chad Davis, described the outside decorations as 'awesome', but inside are even more spectacular gems. "Not only do they have the tree and stuff, but they also have this wicked candelabra thing," said Davis. "And the tree isn't just a regular tree either, it's two stories high." The Mayer tree is a stately Fraser fir that reaches almost to the top of the vaulted ceiling. In fact the tree is one reason the Mayers are reluctant to take down their decorations. "We struggle getting a two story tree in here every year," said Elise Mayer. "We always end up scratching the door frame and the wallpaper in the entry hall. I'm not in any hurry to go through that again." The Mayers have consulted their Christian friends about when to take down the decorations, but have received no consensus on the issue. "Most people have said that New Year's Day is the day they are supposed to come down," said Marty Stein. "But when you look around, most people still have wreaths and stuff in their windows. One family told us the last day for decorations was twelfth night, whatever that is." Downtown() Bearing furs, skins, and jewelry from his latest western journey, Jasper native Sam Causey traveled into town Monday in order to barter for much needed supplies. He brought with him a stack of 'ugly bucks' that had been willed to him by his uncle. 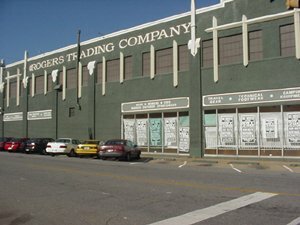 His first stop was the Roger's Trading Company (formerly Roger's Army-Navy) Store on first avenue north. But that trading post was closed and Causey had to hitch his wagon south through the Red Mountain Pass onto Highway 280. It seems that the downtown location was too close to the frontier and had to be moved to a safer location, protected by Fort Summit. The sojourn down Highway 280 proved difficult for Causey and his wagon as he was stuck near Rossi's for almost an hour between a Mercedes M-Class and a Chevrolet Suburban. When Causey finally arrived at the new trading post, they refused to trade beaver pelts for the Eagle Creek luggage that he wanted. Causey then tried some 'ugly bucks,' which he repeatedly referred to as wampum, but Roger's personnel informed him that they had stopped accepting that currency quite some time ago. Causey finally attempted to use something called a 'credit card,' but his uncle's account was no longer valid. As a last resort, Causey headed to a place in Fairfield called Archie Phillips were it is rumored they have need of animal skins.